Spring is here and for millions of Americans, that means pulling the ATV out of winter storage. It’s been a long, chilly few months since your last ride, and you’re probably itching to get rolling. 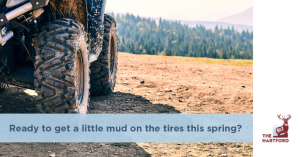 But before you hit the trail or haul that first load, you’ll want to make sure your four-wheel friend is in good working order. Taking the time now to run through this checklist will help ensure your vehicle runs smoothly and safely all season. Don’t assume all is well if you don’t find any mechanical issues. Did Mice Winter in Your ATV Fender? Take a close look behind body panels, storage areas, inside fenders, and inside mufflers and air inlets for signs of mice and other rodents. They love to crawl into tight spaces and build nests, especially if your ATV has been kept under a cover. Does Your ATV Have Any Leaks? If there are leaks, get them taken care of immediately and, if necessary, bring your ATV to a qualified mechanic. If you prefer DIY and have the skills, break out the owner’s manual and make the needed repairs. Check the oil levels and figure out when your oil was last changed. Ideally, you had it changed before storing your ATV for the winter but, even if you did, it’s probably a good idea to change the engine oil and, if applicable, the transmission fluid before the start of the spring and summer season. Remember: Unused oil that has been sitting for can congeal, significantly reducing its ability to protect your gears from wear. For the recommended weight and amount of oil needed, check your owner’s manual and then pick up a new oil filter. Some manufacturers recommend using some type of synthetic motorcycle oil, so keep that in mind. The oil change might not be as easy if you have a UTV. If you can’t manage the task on your own, take it in to the shop for an oil and filter change. Whether or not your battery is still kicking come spring will depend on whether you put it on a charger over the winter. If you didn’t, there’s a pretty good chance your battery is dead and may need to be replaced. If that’s the case, check your owner’s manual to be sure you are buying the correct battery for your ATV. If it’s still got some life, you’ll want to visually check your battery for signs of leaking fluid or corrosion on battery terminals or nearby parts of your machine. If you notice your battery needs topping off, be sure to wear safety gloves and goggles and only add distilled water to adjust the electrolyte levels. Once that’s done, go ahead and charge the battery if it isn’t already fully charged. Your engine and transmission are not the only parts of your ATV that need lubrication. Coolant and brake fluid levels are also vital to the longevity and health of your machine. You’ll want to inspect for and address any leaks before you ride. Be sure all fluids are at their proper levels and, if any are especially low, go back over your inspection list to see if a leak is the culprit. Consider draining and replacing the fluid entirely, especially if there are signs of wear or if you haven’t replaced it in the past few seasons. This is especially true of brake fluid, which absorbs moisture from the air and can get dirty and less effective over time. Your engine needs a steady supply of clean air to run efficiently. To keep a supply of clean air flowing through it, the air filter must be clean and dry. When taking your ATV out of winter storage, be sure to check the filter before you cold-start your machine. Another reason to check air filters: They are a favorite spot for critters building nests. While rooting around inside your ATV, don’t forget to check what kind of shape your spark plugs, chains, belts, and cables are in. If any of these parts need swapping out, now is the time to do it. Cables should be checked for frays and weakness. Belts should be checked for stretching and wear and tear. For chain ATV’s, check for chain slack and adjust it according to the owner’s manual. This check will also remind you to make sure you’ve installed one or more spark arrestors. If you live in an area that’s dry and prone to wildfires, chances are that they’re required. If you’re not sure if they’ve been installed already, stick a stiff wire into the exhaust of your ATV—if something stops you after an inch or two, then you’ve got an arrestor in place. If not, a mechanic can install one for a fee. Checking controls to ensure they work smoothly. Inspecting the throttle and other cables to make sure they move smoothly and snap closed with the handlebars in any position. Checking to be sure the throttle limiter (if equipped) is adjusted appropriately for the rider. No doubt your tires lost some air over the winter months and possibly took a beating last season. To ensure your ATV is trail worthy, you’ll want to be sure that tire pressure is set and maintained to the manufacturer’s specifications. Having correct tire pressure is not only important for safety; it also makes the ride more enjoyable. You’ll need a low-pressure gauge to measure tire pressure because automotive tire gauges are not accurate for ATVs. Sitting in the cold can also cause rubber parts of your ATV to develop cracks, flat spots, and other problems. This applies to hoses and handlebar grips, as well as tires. Don’t forget to check for cuts or gouges that can cause air to leak out. To avoid loss of control, make sure axle nuts are tightly secured with cotter pins and that wheel nuts are torqued sufficiently. And, while you’re at it, check your brake pads. If you can’t see indicator marks, they need to be replaced. More wear on one brake pad than the other means it’s time for an alignment. If you see any buildup of dirt and debris on your rotors, give them a good scrub. Check your caliper seals and replace them if needed. Brake controls should operate smoothly and be adjusted according to the owner’s manual. The foot shifter should be firmly attached and positioned for safe operation. Now that your ATV is revved up and ready, it’s time to think about safety. The ATV Safety Institute is your one-stop resource. The Irvine, Calif.-based nonprofit offers lists of rules, training, and tips on riding gear and state regulations. Their available courses include a free e-course and modestly priced hands-on training courses for adults and children. The group also offers free downloadable guidebooks and an ATV readiness checklist. With your ATV all checked out and ready to rip, what else could you possibly need to know? How about a few tips on keeping your machine bright and sparkling after you’ve played in the mud? With prices running as high as $10,000 for high-end models, these motorized toys represent a significant investment. It only makes sense to protect your investment from the elements, so it continues to run well and look good. Covering your ATV and storing it in a barn or garage are two ways to show your machine some love. Washing, drying, and shining up your motorized play thing will help keep it looking spiffy for years to come. If you made changes to your insurance coverage in the winter months, make sure you have appropriate coverage before you get out there and ride. You may consider speaking to your insurance company about available discounts and any optional coverage that will help you worry less about the unexpected and enjoy your adventures more. We would love to hear from our Extra Mile ATV riders! Now that you and your ATV are ready for summer enjoyment, share with us in comments what you love most about riding. And don’t forget to come back in the fall for tips on storing your ATV for the winter!